Start of a New Season for The Lake District Osprey Project. We start our new season on Wednesday the 1st of April. 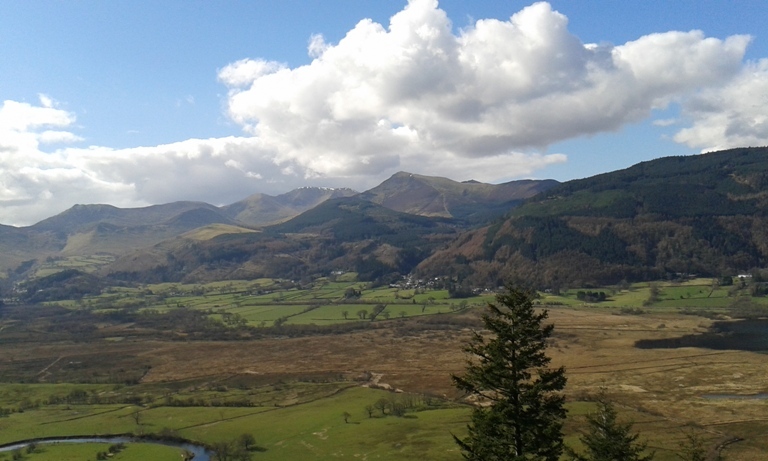 At Dodd, weather permitting we hope to see these views from the top viewpoint, weather not permitting why not go to Whinlatter Forest Centre and see if our ospreys have arrived from the comfort of the Osprey Room with its live nest cameras. While there you might like to take a look at an art exhibition by local artists called ‘Celebrating Ospreys’ – some of whom happen to be our volunteers. You could also take a very nice break at ‘The Siskin’ while contemplating the pleasures of becoming an osprey volunteer – if so ring Nathan on 017687-78469 or just leave your details at the information counter. Chris Pond did and see what wonderful photographs he can take! The Lake District Osprey Project opens officially on Wednesday April 1st this year, with our volunteers manning the telescopes at Dodd and the CCTV at Whinlatter. 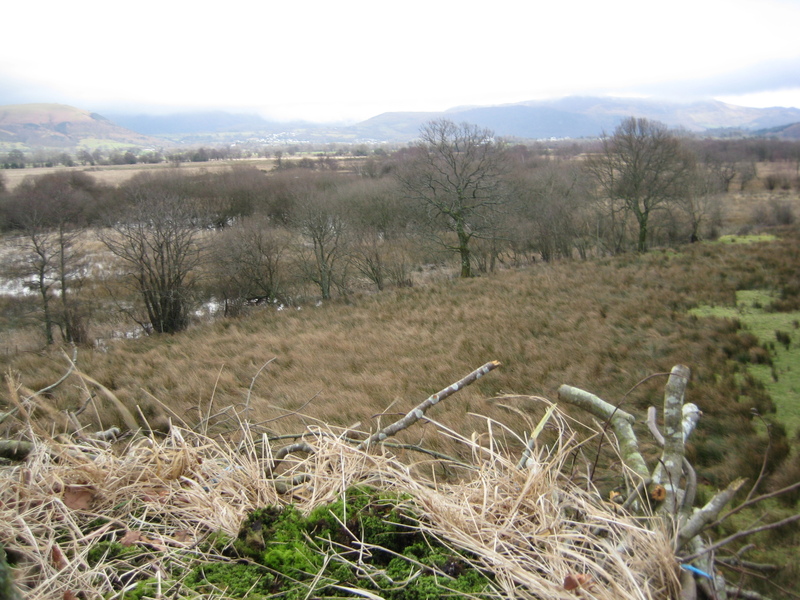 No ospreys settling yet so the countdown is revving up for the arrival of our Bassenthwaite pair. Last year they were spotted on April 3rd (male) and April 7th (female KL) but of course with a 3000 mile run/fly up it is anybody’s guess when the first sighting of 2015 will be. With birds already in Scotland and Rutland all our beady eyes are fixed on the Lakeside nest and surrounds. This season will be the fifteenth year of breeding and what a roller-coaster the experience has been! It’s worth reviewing some of that amazing journey. Starting in 2001 No-ring and SX were the first breeding pair to make a permanent nest site in England for at least 150 years. Their first sets of chicks disappeared into the wide blue with the knowledge that even if they survived the journey we would not see them again for 3 years or so. Elation – when one of our fledglings was photographed in Norway. Frustration – when the next few years were barren. Feelings akin to grief when our founding father No-ring and others have ceased their flight in this world. Wry amazement as our engineers found themselves chasing around the valley again wheeling out more yards of cable and setting up more cameras as the birds decided to swop sites. Protection venues have ranged from ‘home from home’ huts to camping out on a 30 degree slope to standing up under an umbrella for the night. The birds have given us all, visitors, volunteers, staff, so much joy, providing us with opportunities to tell fisherman’s tales (with arm gestures) of pike and salmon ‘that big!’ And there is no doubt there is nothing to beat the white wobbly cuteness of a day old osprey chick. Then more recently there has been the break-through in technology where transmitters have become light enough for a bird to carry and we are filled with wonder as those same chicks navigate across the planet. More tales – of 1000 mile non-stop flights, ocean crossings, white beach idylls and death under the shifting sands of the Sahara. And now, in the last two years, justification of all striving, both bird and human, with the next generation touching down at Bassenthwaite, South Lakes and West Scotland to produce their own chicks – and so the story goes on. What will 2015 bring? Well, you’ll just have to keep reading the web or preferably, visiting the North lakes to see what the Bassenthwaite ospreys are doing for yourselves! 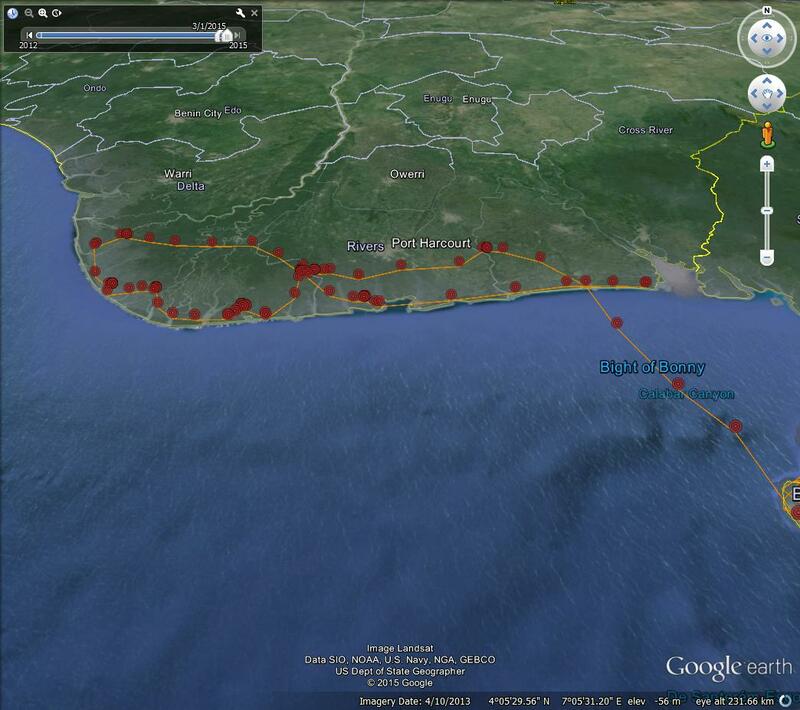 Lake District Osprey Project; No.14 Returns to Bioko. Having taken a short break on the mainland Number 14 has now returned to Bioko. During the seventy mile crossing he seems to have even taken time out for a little fishing (two dots next to each other). Meanwhile back at his birthplace preparation is being made for the next generation. If you are interested in volunteering this year why not come along to our ‘Introductory Osprey Evening’ Friday 13th March, Crosthwaite Parish Hall, Keswick 6.30 in the evening or ring Nathan on 017687-78469. 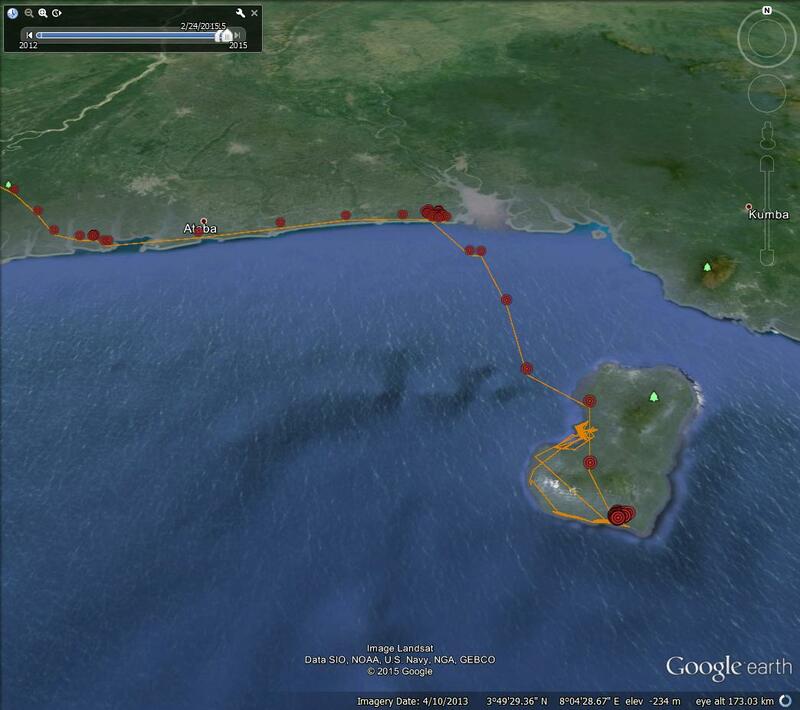 As Number 14 continues to study the coast of Nigeria, back in Cumbria things are starting to move. A Red Kite has been seen over the M6 near Shap, yesterday and today. Could it be one of the ones released at Grizedale a few years ago? Look out for a buzzard like bird, but with style as well as the famous forked tail which seems to operate on its own. 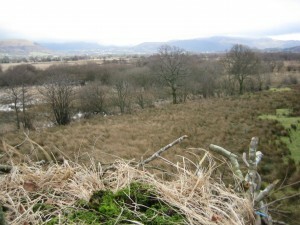 Curlews are also being seen on the fells having wintered on the coast. At Whinlatter the frogs are beginning to get excited on the pond and there are a few Crossbills around. Time to polish up the old binoculars and start looking. Migration or holiday for Number 14 ? It’s beginning to look as if Number 14 has gone on a holiday visit to the mainland. Over the last few days he has moved east along the coast, crossing the point where he came ashore from Bioko last week. The thunder storms from last week have also disappeared so that may have something to do with it, just thirty degrees and a little rain forecast for this week – just like Cumbria then, but without twenty eight degrees. 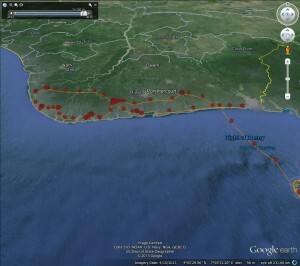 Next big question is will he cross the border into Cameroon – yellow wiggly line right hand side of map ? Is this another country for the L.D.O.P Quiz team?